This past weekend was an absolute blast as we celebrated my daughter’s 1st birthday. I am dying to show you all of the details and DIY projects but I have to hold off just a bit! BUT since I tend to be a little impatient, I am giving you a sneak peek into the theme of the party by sharing one of my projects with you, a tea stained coffee filter wreath. This project may just look like another decorative wreath, but it actually holds a lot of family history and was a very special addition to her party. I’ve seen some beautiful coffee filter wreaths and I have fallen in love with them. They are simply gorgeous and I knew I wanted to make one for Baby E’s birthday since it fit perfectly into the theme. I wanted a more vintage look so I tea-stained the coffee filters using tea from my collection. I love the texture the coffee filters bring and the romantic look. As I mentioned earlier, this wreath has become very special to me because the gems used in the wreath were actually my great grandmother’s and the person who Baby E was named after. 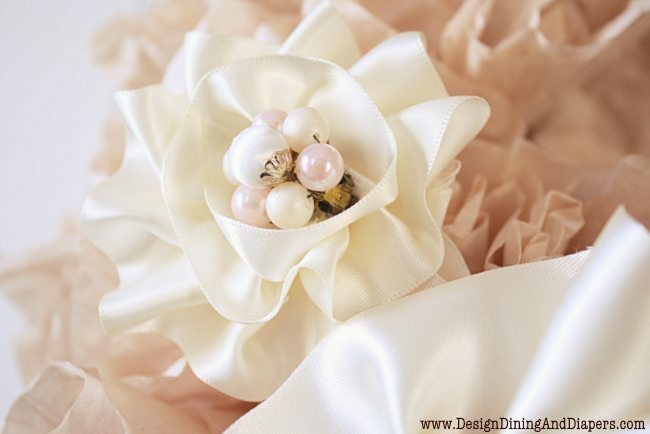 The pink and white pearl clusters were actually a pair of her earrings and the brooch was a gift given to her for 30 years of volunteer service at a local organization. 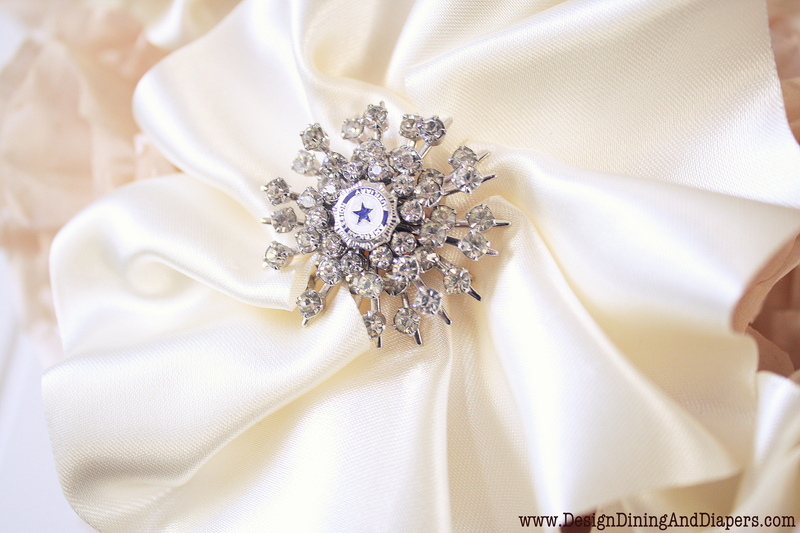 The ribbon also holds sentimental value as it was left over from my wedding day. I really enjoyed making this wreath and I am really happy with how it turned out. It will be really special to tell Baby E about it one day. In case you are curious on how I put this together, here are some basic instructions. I clipped the coffee filters onto pant hangers and hung them in the laundry room to help them dry faster. I also spread a few out on top of paper towels and that worked too. Repeat until the wreath is completely covered and add some bling of your choice! If you like this, you are going to LOVE Baby E’s party! That wreath is breathtaking. And how touching to incorporate those special gems. GORGEOUS! I LOVE, love this. Actually, I have to make one, like ASAP. :) I was thinking about using food coloring though, and different flowers, so it won’t be a complete copy of yours. :) Thanks for the idea! Not a huge fan of non-winter wreaths, but this is really beautiful! Love it Taryn! So cute! I pinned it ! I LOVE this…can’t wait to make one myself. I need a new wreath for Spring and this is perfect. Thank you for the tutorial! This is just lovely! I love that you made it sooo special! I also like the idea of using different colored filters! Thanks for the inspiration. Okay this looks UH-MAZING! I love how it turned out. Defiantly pinning for future reference! this is beautiful. i want to make one, but i’m not sure if it would be too fragile to put on an outside door. what do you think? This is so beautiful! I love it. Thanks for the tutorial. i fell IN LOVE with this…i ended up making it without the bow and gems [a lil too blingy for my home decor] and it came out REMARKABLE!!!! thanks for the inspiration! 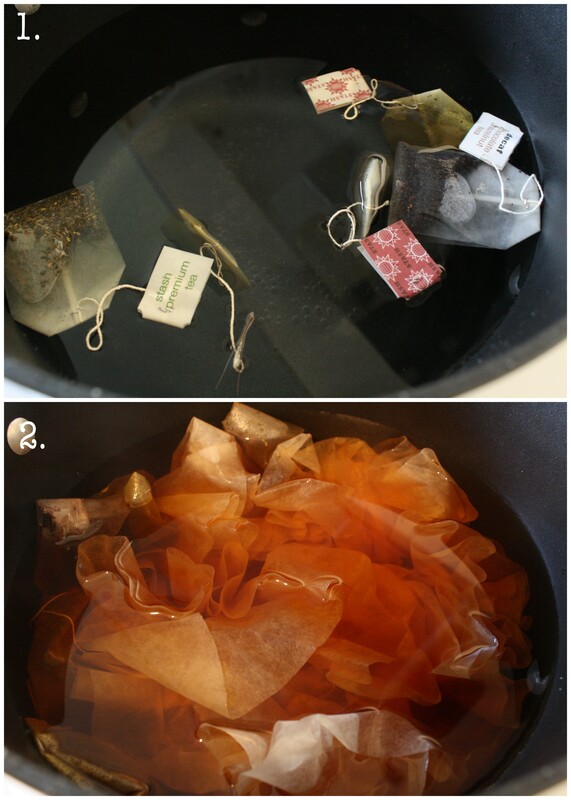 here’s a tip: after taking them out the tea brew, get out as much tea as possible and then toss in the DRYER!!!! i became too impatient….LOL they dried FAST so this project took less than an hour, from start to finish!!!! This is seriously AMAZING!! I adore everything about it and your photography is just lovely! Thanks for sharing at oopsey daisy! Lovely – I loved the look of this wreath! Very nice job and thanks for sharing. I “hopped” over from Chic on a Shoestring link party. Hope you can “see” me too! So gorgeous!! Thanks for sharing the tutorial! 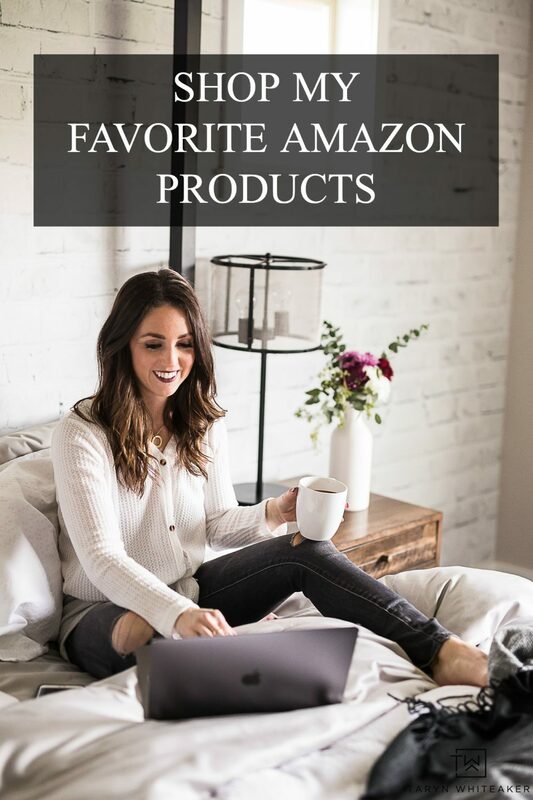 I featured you today in my Friday I’m In Love favorites! I am totally obsessed with this and have been waiting for the tutorial since I saw it on ECE’s competition. Good luck with the rest! Hi! I’m Elyse from Shabby Sweet Tea. 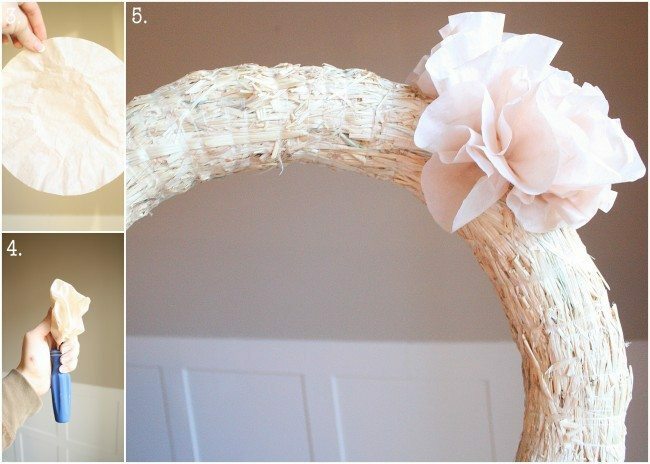 I saw your wreath on Centsational Girl’s Spring Craft Link Party. 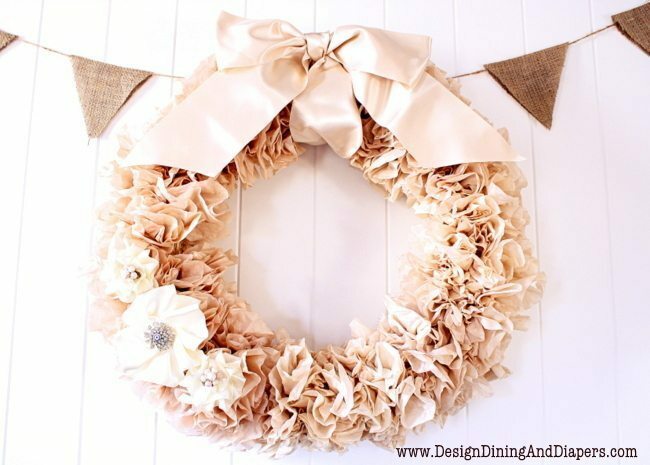 I have seen many coffee filter wreaths on blogs and Pinterest. I must say, yours is by far the pretties!! You just added a new project to my list. I will be checking back to see more of your little girl’s party! Have a great weekend. Following on my way out! Just to let you know I featured your beautiful project on homework today. Come over and grab a featured button if you’d like. Have a great weekend. Wow! 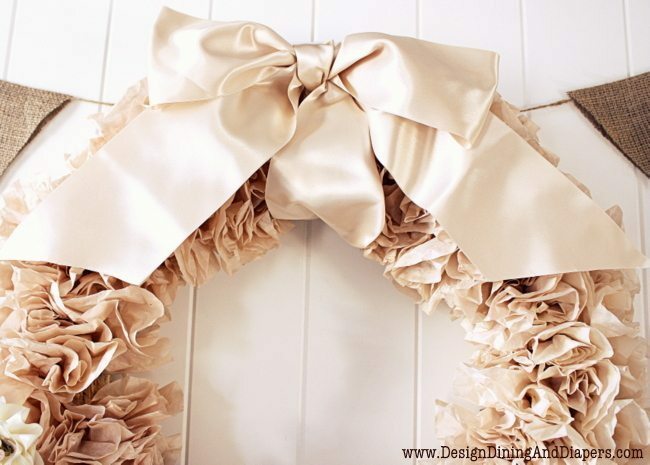 This wreath is so beautiful ad romantic looking!! Love it!! Great job! This is so pretty and girly! I just dyed something for the first time (pants) and it was really fun! I love it! So pretty and delicate. My cats eat anything with foliage, so I’m going to have to try this around the house as an alternative to the usual spring wreaths. Really lovely! I think the doing the tea-staining yourself rather than using unbleached coffee filters really gives it better dimension and a nice softness. I love the brooch and earring accents – so beautiful. 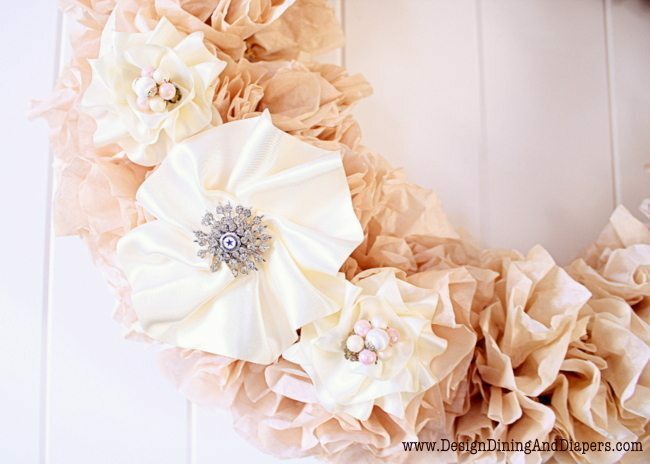 That is the prettiest coffee filter wreath I’ve ever seen! I love I found you at Homework’s party. Have a great week! The Breville Automatic Tea Maker & Kettle is great for lazy people like me. I am complete sipping a cup of tea in the morning facing to monitor. Tea is a fuel to make the engine function and flow. Oh that wreath is SO beautiful!! Amazing. And I think I could actually do it! 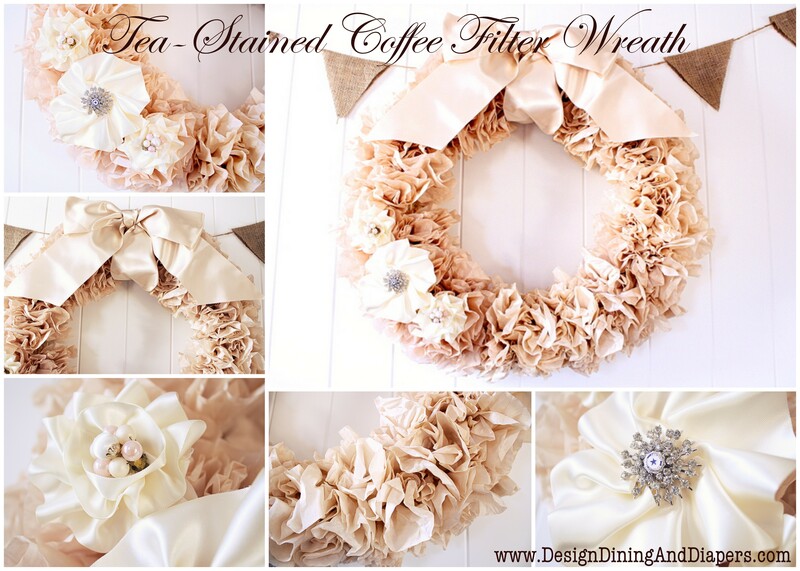 This is my favorite coffee filter wreath ever….the special and sentimental touches make it extraordinary! Beautiful, beautiful job! This is so gorgeous and glamorous. I can’t believe it’s coffee filters! I love this! This is gorgeous! I love all the personal touches. Just letting you know I’m featuring your absolutely GORGEOUS wreath today for Feature Friday FREE-FOR-ALL. Beautiful… and the detail wow! From one Taryn to another… wow! Very beautiful. Thank you! How did you get the ribbon to look like roses? Was it gathered and sewn along the edges and then swirled into place or some other technique? I’m just not sure how to get those rosette looking ribbons? I fell in love with this gorgeous wreath, can you however tell me the size of wreath you bought and if you spray painted it. Absolutely gorgeous! 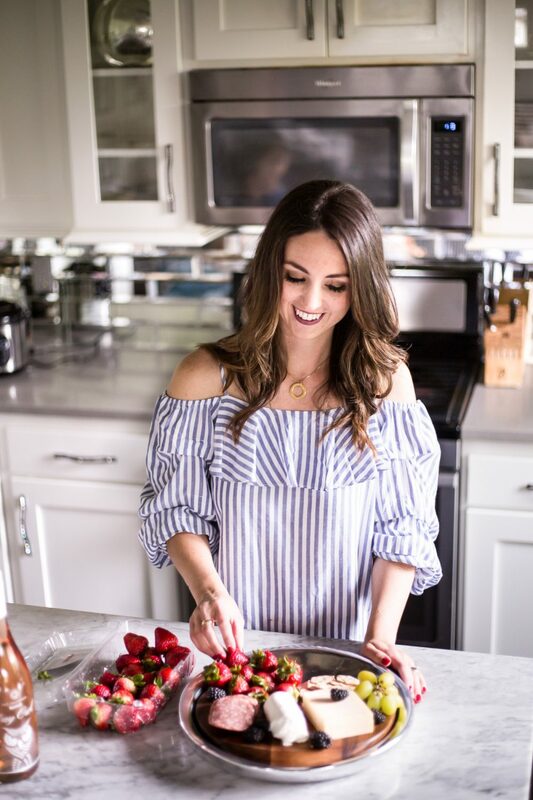 I’m loving this…particularly how you were able to add such meaningful, sentimental connections to yourself and your grandmother. What a special treasure as well as a beautiful piece of home decor. Thank you so much for entering this in One Crafty Contest; best of luck to you! What size wreath did you use? Beautifully made. Hey there, wondering what kind of wreath you used? is it Styrofoam? I have never seen one with the straw material before.Do you think I could get it at JoAnns or Michaels? Thanks so much for posting this. So lovely! 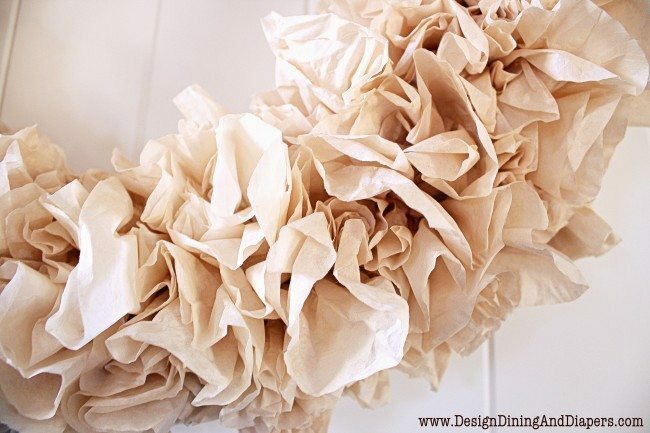 I have seen a lot of coffee filter wreaths, but this is the prettiest one I’ve ever seen! Thank you for sharing! I am absolutely in love w this and I can’t wait to use these ideas for my daughter who will be 1 soon!!! Thanks for your creative amazing work!!!! Thank you for your post. I have a lot of coffee filters left over from other projects. I now know ow what to do with then. I love the ideal of using the gems. I believe I will do the same. Thank you for that ideal. One question though, you said you just pushed the filters into the wreath and it stayed? You did not have to use glue or pin any of it?. Again thank you for this beautiful post. No glue :) I wouldn’t pull on them, but they do stay in pretty well.